When one thinks of a winery and wine making, one often imagines wine aging gracefully in oak barrels. And so it was when we bought our house and winery, for in the cellar were 10 oak barrels, sizes from 15 to 600 liters. Most were in poor condition. Some were leaking. Others seemed to give unwanted flavors to the wine they contained. Over time, I eventually removed them all from the cellar. 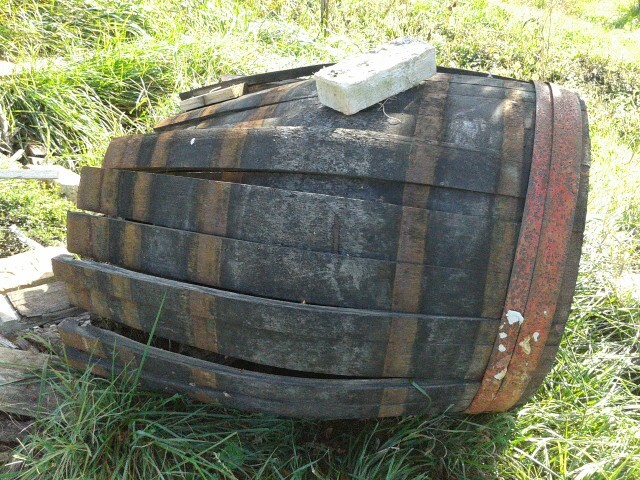 A 350 liter oak barrel I removed from our cellar. An oak barrel has an interesting life expectancy. Barrels which are used to age and “oak” wines, will only last 3 to 5 years before they become essentially neutral containers and provide little or no such oak characteristics to wine stored in them. Other desirable characteristics of the wood, such as being semi-permeable to oxygen (useful in aging red wines) declines over time as the wood pores get clogged. Wood barrels are also subject to rot, and are difficult to clean well and to maintain. So many wineries simply dispose of their barrels after half a decade or less. A sad end to the coopers art. Oak barrel being broken up for firewood. One benefit of living in Hungary is the availability of high quality locally made Hungarian oak barrels. But oak barrels from any source are expensive. And for many white wines, “oaking” them is not necessarily desirable or even recommended. I prefer that my white wine not spend any time in oak. In fact, it seems counter productive to ferment in stainless steel, which so well will bring out the fruity aromas of a white wine, only to mask them with a thick layer of oak — a mixed wine making style that seems to be all to common. Avoiding oaking a white whine is not a new style actually (after all the use of clay (Greeks) and concrete (Romans) both predate using wood barrels). But this style of wine making has started to see a Renaissance of late. So removing the oak barrels, and not replacing them with new oak barrels, was an extension of my wine making style and was not too difficult a decision to make. As for the old barrels, they are used in outdoor cooking. Texans have mesquite smoking BBQ, and we here have traditional Hungarian pots flavored with Riesling smoke. Traditional Hungarian cooking over oak barrel wood. You can almost smell the wine in the smoke. With all the talk about reclaimed wood products I’d been trying to noodle a way to use our old barrels. I found this place as inspiration: http://scoutmob.com/denver/alpine-wine-design ….but most all of them are a lot of work with little practical results. You probably have right idea to use it to fire up a bograc. That site is indeed inspirational. Thanks for sharing it.